Through March key members of the STP team will be selecting their top 5 favourite pieces of furniture from the archives. They could be old, they could be new! It may be that they loved the design, or some technical aspect of making it. It may be the timber or the combination of materials. There will be an image plus little explanation of why they selected it. These are Simon’s. 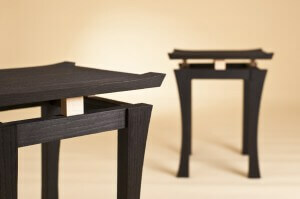 Simon Pirie, M.Sc is the designer but is also an accomplished furniture maker. He originally trained as a sculptor but then found his real niche when he enrolled at Hooke Park College, part of John Makepeace’s Parnham Trust. It was at this experimental college in the woods where he developed his making and design skills, but also a deep understanding of forestry and environmental issues. He is a visiting design lecturer at further and higher education levels and has sat on the boards of Walford Mill Crafts and Dorset Visual Arts / Dorset Art Weeks, of which he is currently chairman. His own workshops were established in 1998 in mid Dorset. 5. It’s really tempting to put a ‘Floating Bench’ up as the first of my top 5 favourite pieces. It would make sense to combine it with the Liberty Outdoor Living Launch this week where it is a key product, but instead I’m going back to the mother ship! 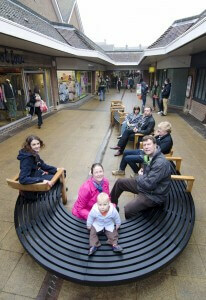 So no.5 is is the Tudor Arcade public seating project, which we completed in early 2012 in Dorchester. The ‘Floating Bench’ came out of this project as a pure stand alone piece; ‘pure’ because I’d intended to have all the arms on this public commission floating as well, but it was just too vulnerable to the rigours of outdoor space. Despite that compromise – it’s ambition, scale and popularity make it something I’m very proud of. It combined very high tech CNC manufacturing with much more traditional methods like steam bending and scorching. Mike made most of this and did a beautiful job of it. I walk past it often, nothing gives me more pleasure than seeing people sitting on it, kids pretending it’s a train, bikes locked to it and dogs tied round it. It certainly is a very popular piece of public art and it has been lovely to do something so public, so locally. There are a couple of videos of how it was made, showing the steam bending and scorching in the case study. Click here to see more. 4. Is the ‘Torii’ side tables. A very personal choice these… This is the last pair in scorched oak in a limited edition of 12 pairs. We have done them in lots of timber combinations over the years. If you can see a Japanese influence you’re not wrong. These came out of a very special trip to Japan with my brother in 1995, although the first set of these was not made until 2000. We made 12 pairs over 12 years, in sycamore, walnut, cherry, elm, lacewood and lastly scorched oak. There is something about the simplicity of the design which is very satisfying. You can find out more about my trip to Japan and it’s influence on me and my late brother on the blog by clicking here. 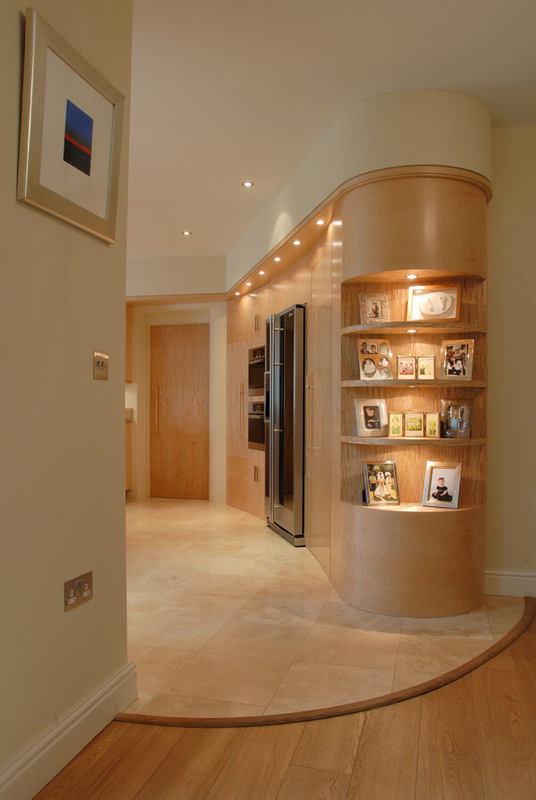 For me then it’s this gently curved and lit wall in a kitchen we did back in 2006 in Poole. I love the whole project but think this was my favorite little bit. The curve is very subtle and includes the ovens, fridge and a doorway through into an enormous larder space behind (which is always full to overflowing!) Materials are ripple maple and mazur birch, although the kitchen also contains elm and burr elm in places. 2. 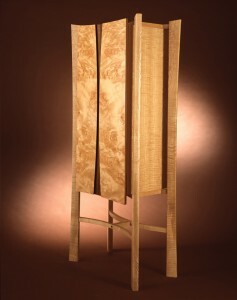 At no.2 it’s this ripple ash, burr sycamore and walnut drinks cabinet. Lovely piece and lovely timber combinations. Perhaps it also fits my own fantasy of a piece of furniture I’d want in my own home to fill with nice single malt whiskies! Another common theme that runs through most of these choices is that they are usually a commission from a client that I get on really well with. This one is no exception. Dennis and Eileen are from North Yorkshire, but they came across me at a show in Poole we did with fellow Purbeck furniture makers Cameron and Talbot. They have commissioned various pieces, and for whatever reason they always seem to bring the best out of me as a designer: Perhaps it is just the complete trust they place in me to come up with something and their enthusiasm with the end results. I think this piece had been in the back of my mind for some time, it just takes the right client to unlock that potential. I love the way the cabinet section is suspended in the framework. There are lots of subtle curves and angles so it’s a much more complicated piece then it first appears. Perhaps I’ve never bettered it, there is a kind of naivety in doing something for the first time where you are not held back by the most efficient way of machining something or using timber most cost-effectively. As a result it’s a pig to make, taking twice as long as an ‘Impala’ chair, nevertheless we do still make slightly revised version, ‘Oryx2’ today. I’m still very found of it, it is beautifully, almost classically proportioned and supremely comfortable. When I sit in the armchair it’s like therapy, the arm detail lets my hands wrap around it, the curved slats support the back and that lovely top rail rail does the same with the shoulders. I’m not alone in thinking this, I have friends who make a bee-line for it as soon as they are through the door. I do have a really early version here at home and it’s still looking great. So while some of my other choices in the top 5 may be fluid, this chair would always be at no.1. 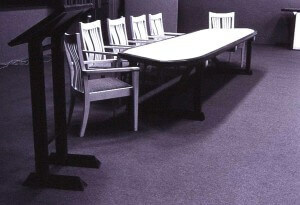 That first set in 1993 was designed for Bournemouth University, for their main lecture theatre furniture. It’s been used as the platform table for many debates over many years. These where all in sycamore, the idea being that they stood out and had a real presence in such a large auditorium. I took this shot soon after it was commissioned, it’s a rather poor shot taken before the room was renovated and the colour scheme matched the furniture, hence the black and white image. It’s in sharp contrast to the image above, which again is the first and still the best! They have been made in many materials over the years, but I think they still look best in oak. The classic combination is oak and walnut, best seen in this fantastic 14 seat dining set for the Lulworth Estate completed in 2009. 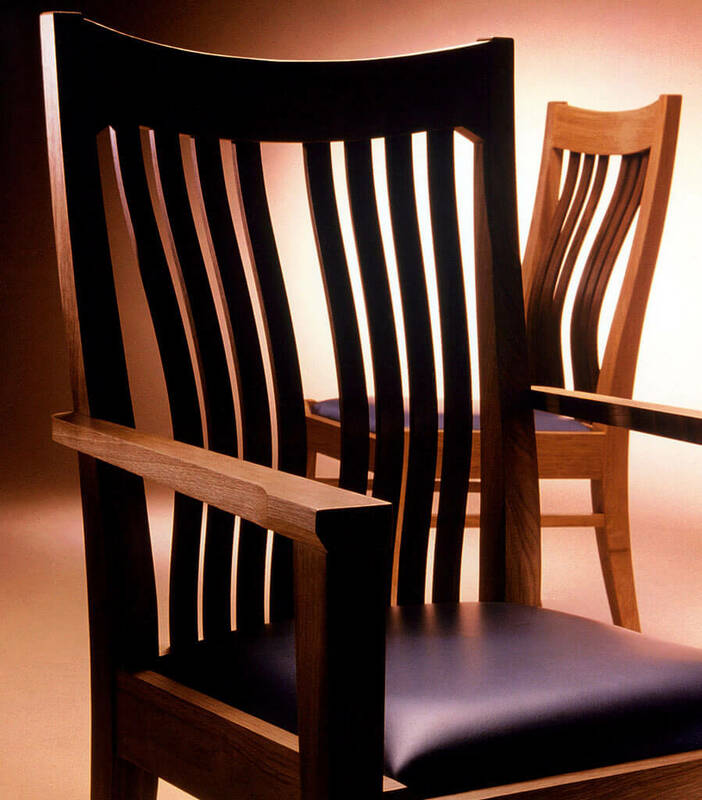 There are 2 armchairs, with the rest being the ‘Grand’ 8 slat version of the dining chair. 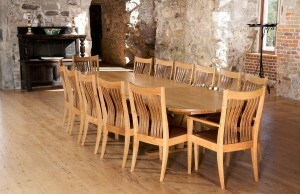 We also do a smaller 6 slat version of the dining chair just in case you don’t have a castle! You can see one in the background of the main image above.